Are you looking for simple mehndi designs? 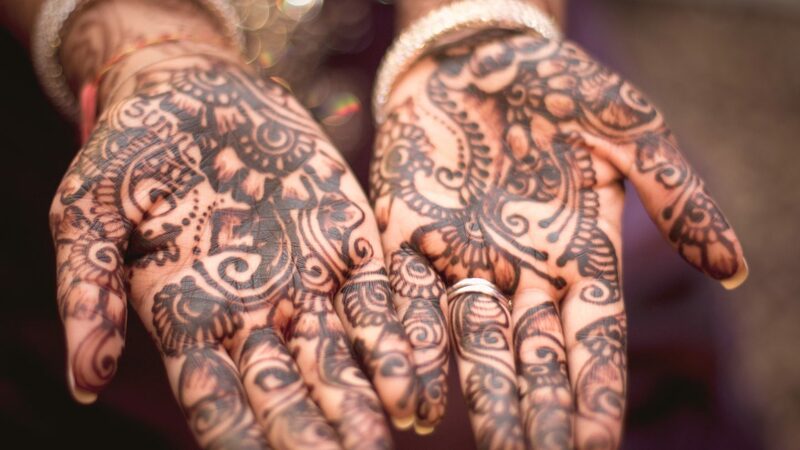 Call it henna, call it mehandi, but it remains one of the most beautiful and symbolic body decorations to date. 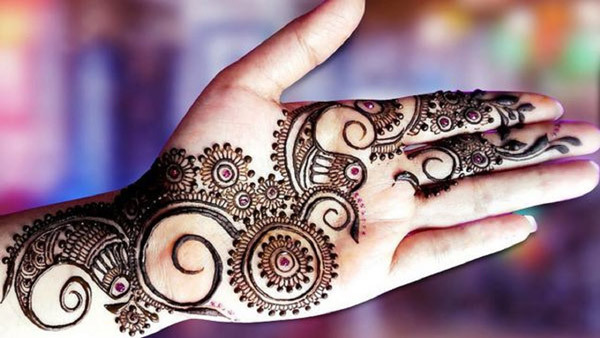 You could be a South Asian bride getting ready for her big day or just want a cool-looking tattoo somewhere on your body – mehendi is the magic stuff! Bold, versatile, delicate and intricate, even a simple mehendi design could bring a smile to a girl’s face and a skip in her walk. 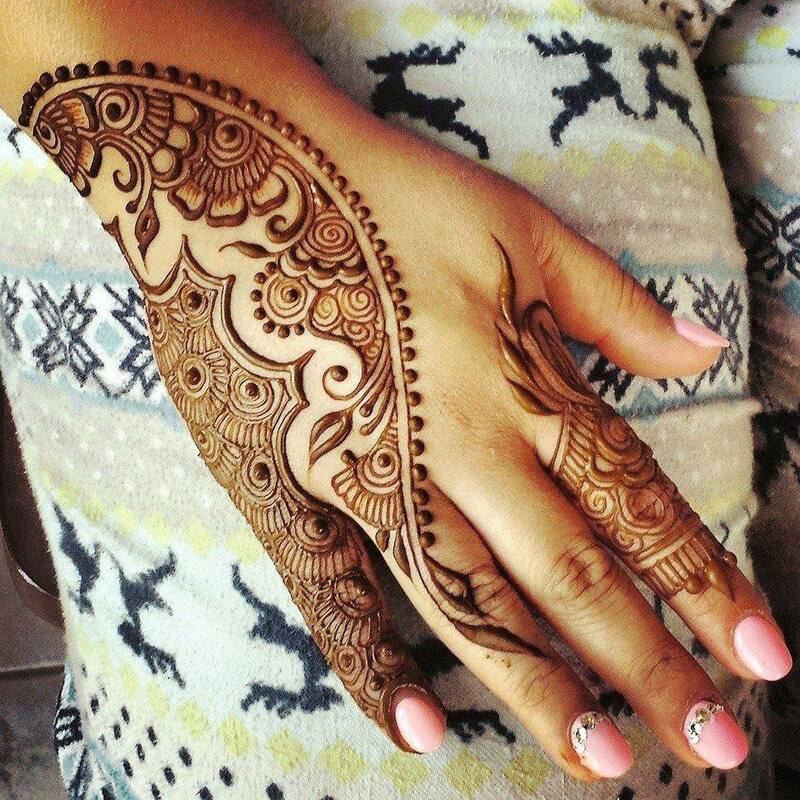 Traditionally, mehendi is applied when a big event like Eid, Diwali, or a wedding was near. Now, it could be a fashion statement no matter what the season or area of the world you live in. As the times change, fashion also changes, and the same goes for mehandi designs and patterns. Traditionally, mehndi designs would be closely worked all over the hands and feet, occasionally even the arms and lower legs. 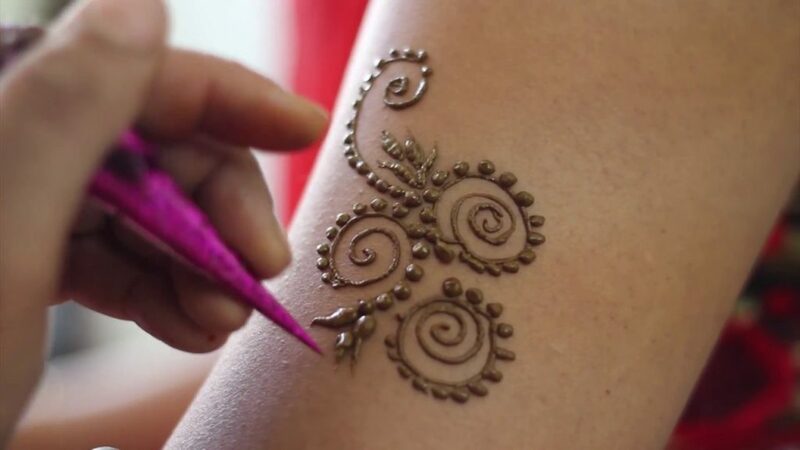 Now, henna designs are even becoming common in the modern Western world. The age of simple mehendi designs is on the rise, and these include different styles that are just as beautiful as the traditional ones. 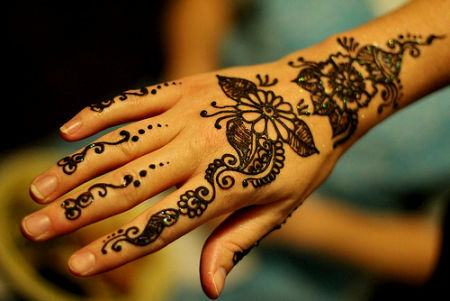 If you’re interested in applying henna designs on yourself or your friends, don’t hesitate! It may seem a bit intimidating, especially if you don’t have much experience in drawing, but some mehendi designs are so simple that anyone can do them. Once you get the hang of a few simple mehandi designs, you’ll be going for the expert patterns in no time! Young girls are especially interested in experimenting with simple mehendi designs. It is actually quite easy for anyone to start out applying such patterns with a little bit of help from the internet. Your own imagination doesn’t hurt either! Mehendi is usually ascribed to females, especially when it comes to simple mehndi designs like flowers, paisleys, butterflies, etc. 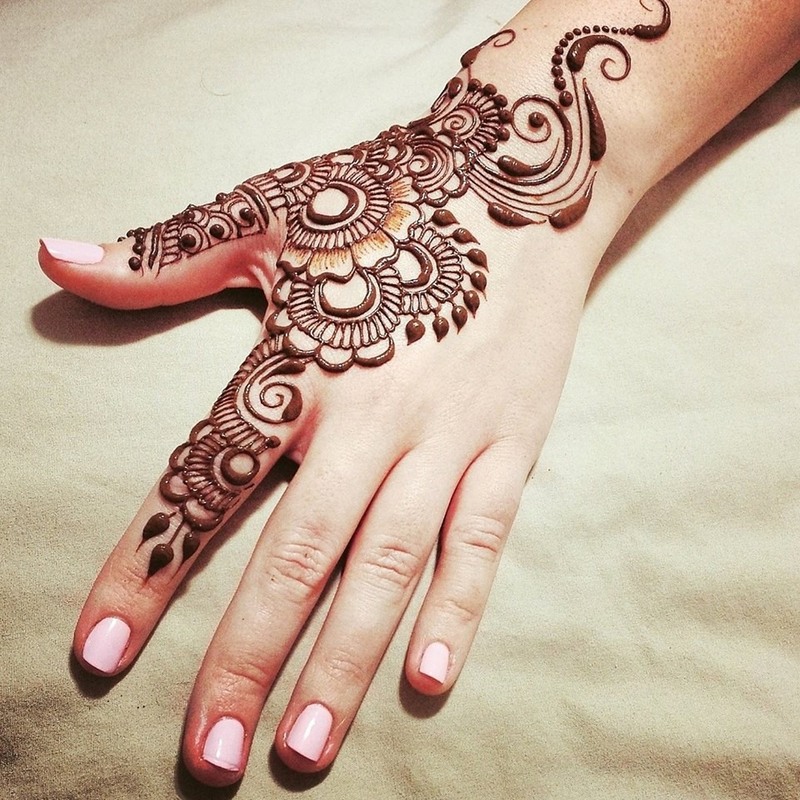 Applying henna and getting it applied is the perfect way to unleash your girly side! Applying mehndi designs can be a messy process. If the paste gets somewhere it shouldn’t, even a simple mehandi design could be ruined. If one is not in practice, the design could turn out looking strange rather than beautiful. It is recommended that you leave the experimentation up to the experts. Mehndi or henna stains are very difficult to get out of or just about any surface. Even though the designs are temporary, a mehendi design would still stay for at least a few days. Knowing about these risks before you apply any simple mehendi design can help you avoid many problems. It is well worth your while to look around and do a bit of research in order to get the best and most natural form of henna. If you want a safe but perfect application of mehndi, mixing your own henna paste and practicing your preferred design is really the best way. It may take a long time and quite a bit of effort, but it’s worth it if you want the benefits of mehndi designs without worrying about it all the time. Mehndi designs are meant to be enjoyed, not become a serious health issue. 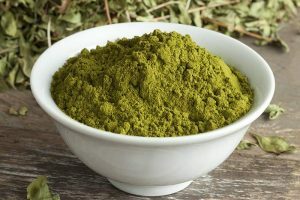 For making henna at home, you would need henna powder, which you can get at any good pharmacy. Try an Indian store if you don’t live in a South Asian country. Sift the henna or mehendi powder and put around a quarter cup into a plate or bowl. You can freeze what’s left over. Make sure the mehndi color is between green and brown. Add half a cup of lemon juice into the powder. When stirred thoroughly, the paste should be a little thinner than toothpaste. Add more juice if it’s too dry or more powder if it’s too wet. You’re looking for something that could run through a tiny needle-fine opening yet stay on the hands without bleeding or running. Next, put in around half a teaspoon of sugar and a few drops of eucalyptus oil. This would give the mehendi a silky consistency. Add in the tea one tablespoon at a time. This helps the skin stay smooth and uncracked when the mehendi dries. Cover your paste and let it be for a whole day at room temperature. Afterward, put the mixture in a squeeze bottle. If you know how to make a cone out of thin plastic sheets, you can do that and put the henna inside. Poking the point of the cone with a pin would make the henna flow out. This sort of mehendi design is better done if you have some experience with a cone. However, you can also utilize a squeeze bottle and achieve similarly pretty results. All you have to do is print out the design on paper and practice with it. You can then use the outline on paper to stamp the mehendi design on your hands. If you feel confident enough, you can try drawing it directly on your hand. This mehendi design simply involves drawing a wide-petaled flower inside a circle. The circle itself is decorated with a few simple dots, lines, and curves to give it a traditional look. You can add a few leaves and even make it sparkle with body glitter after washing off the dried henna paste. A mandala is a circular design with Sanskrit origins. It is originally a pattern from Sri Lankan culture, but it has fast gained popularity in other South Asian countries and even modern societies in other parts of the world. Mandalas are similar to the rangoli that Hindus draw on the floor or ground when it’s time for Diwali. However, they also have a history and use of their own since drawing and decorating a mandala is also a meditative activity. They are also popular in adult coloring books or simply as a relaxing hobby. In order to draw a mandala, make a circle first. You then want to divide it into four, six, or eight sections according to your drawing level. You can then choose to fill these in whichever way you like. Each section could contain a different design or be symmetrical to each other. 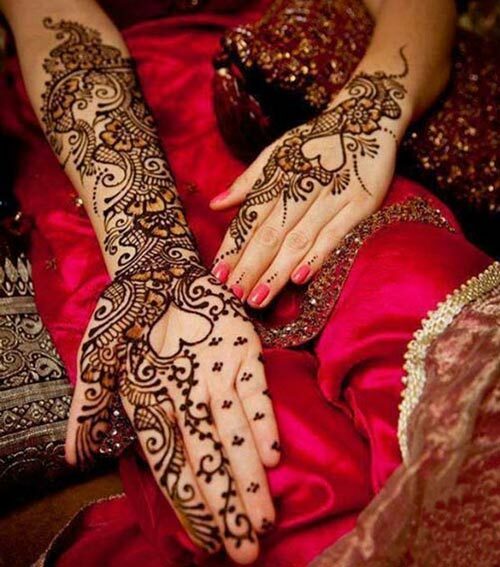 For a finishing touch, simply fill in the top sections of your fingers with the henna paste. This design looks very strong on the hands and is perfect for someone who doesn’t want the usual flowers, stems, and leaves designs. This is also great for a bride who wants something completely different on her big day. In order to make this design, you should make some large boxy shapes on the palm of the hand. They should have quite a bit of gap between them. 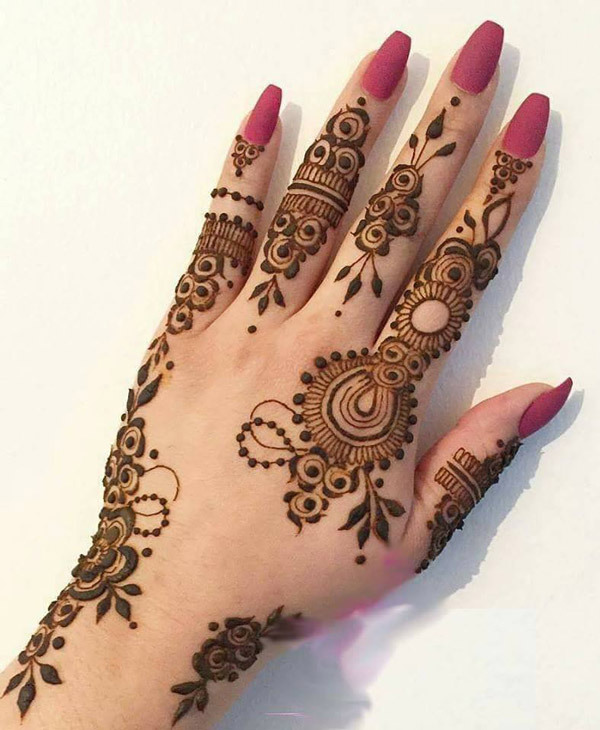 You can also do these on the back of the hand, but the color may not be so strong there, so the palm is the safest option for this henna design. Simply fill the shapes in a solid manner with your henna. 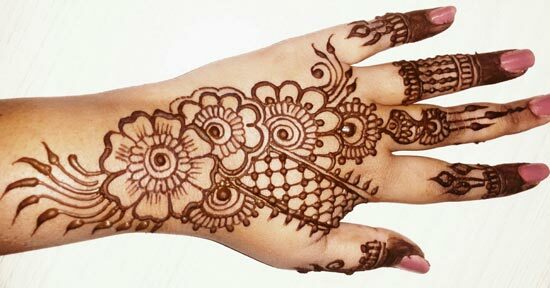 You can then add simple mehndi flourishes in between. This could be a check, geometric designs, or some flowers to make a contrasting effect. This mehandi design is one of the neatest and easiest. It simply requires a nice arch on the hand and the drawing of any easy leaves upon it. Then all you do is draw another arch and the same design. The designs could be simple straight lines with leaves in the middle or just have leaves coming out of each arch. The idea of having leafy arches is a good one since leaves are the most foolproof mehendi designs ever. They also look traditional and can sport a modern look if you keep them a bit wide and empty. You can then decorate your fingers with a smaller version of the arches or simply put tiny leaves near your fingertips. 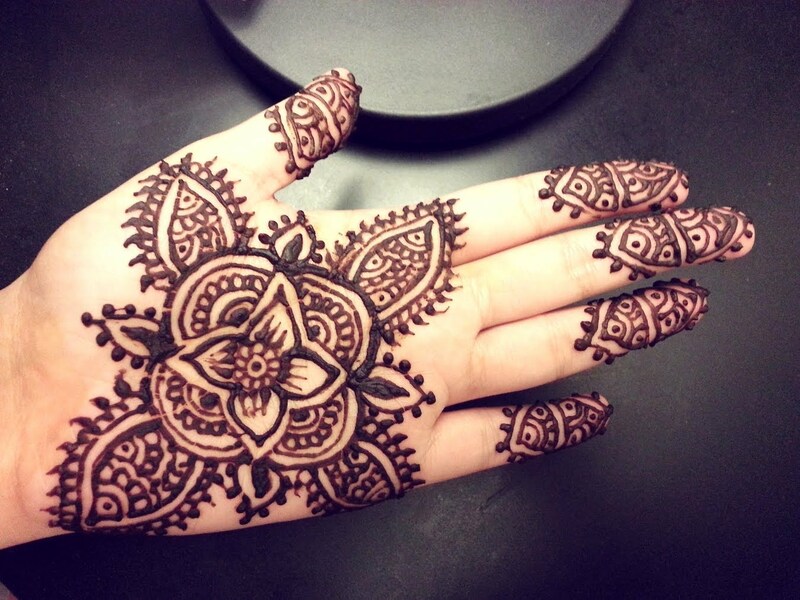 This is a great simple mehandi design to try on all of your friends. One unique, adorable, yet perfectly simple henna design is the anklet. For those who don’t like to sit still for too long, having a leafy stem around their ankle could give that festival look in no time. The anklet could also be an embellishment for other henna patterns on the feet. You can make the stem as simple or as complicated as you’d like. It could even have a few flowers floating around it or some largish leaves with some detailing. For a chic, modern look, you can pick up your henna cone or bottle and squeeze some beautiful, delicate rings on your fingers. A band around one finger, a couple more around the knuckle of another finger, and a few dots underneath the base of one or two fingernails. It can’t get any easier than that! A little swirl or leaf can embellish your rings and make them more eye-catching. We highly recommend doing the thumb as well in order to achieve that complete look. With this simple mehndi design, no one has to sit still for long, and they can look festive without going overboard. 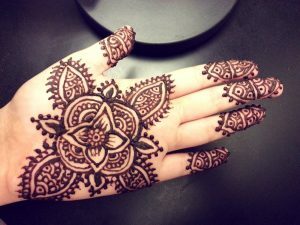 This is a basic simple mehndi design but one that is sure to be a hit at any party! You can switch it up between full detailing or leave some empty spaces to give the design a more startling effect. 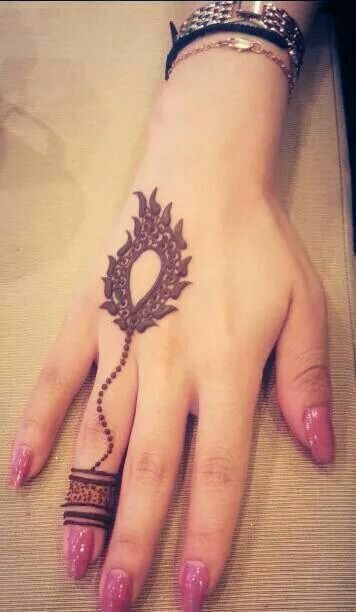 First, you should draw a bangle with your henna cone or bottle. From this, spread out some vine-like detailing and decorate them with specks, dots, lines, or swirls. Join these vines in the center of the palm and make a flower spread out from them. This would give you a lot of room to be as less or more detailed as you wish. Any method you choose would be a beautiful marriage of contemporary and customary simple mehndi designs. For this design, you should be prepared to have empty space on either side of your hand. However, this is what provides the contrast and makes the whole effect so beautiful and unique. You start at the wrist and work your way up, creating a basic paisley routine and filling it in with boxes, dots, lines, leaves, vines, etc. Create a diamond-like shape around the paisley and make its top flow onto your middle finger. Now all you have to do is decorate the diamond as you wish and create a few ring shapes on that one finger alone. This sort of simple mehendi design is very flattering and gives a slimming effect. It is highly recommended for the back of the hand instead of the palm. Other than boxes and geometric shapes, you can play around with a few more ideas for going a non-traditional way when it comes to simple mehndi designs. Try out a butterfly, crescent moon, or stars to get that exciting tattoo feel without the permanency and the consequences. The outlines and ideas about simple mehandi designs above can really help you out in a pinch. These are especially useful if you have to apply the henna designs yourself without the help of an experienced friend or a henna artist. 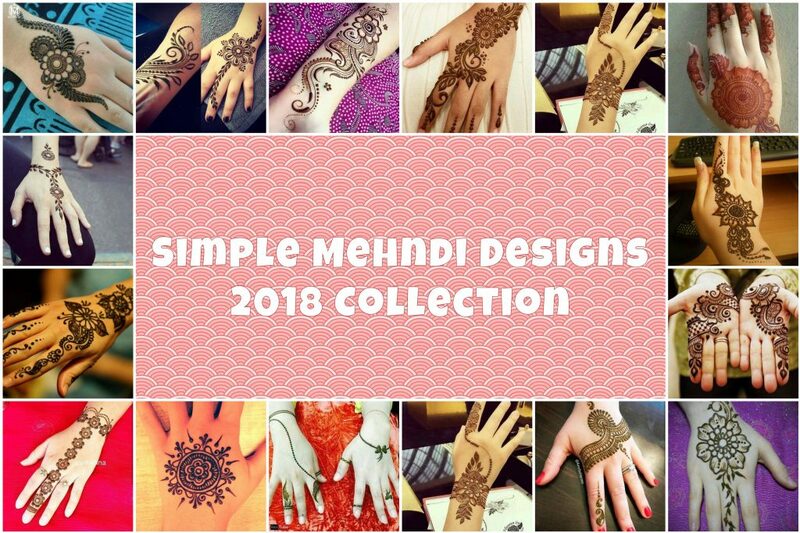 Without some of these simple but gorgeous mehndi designs on your hands and/or feet, you may not be able to grasp the full effect of Diwali, Eid-ul-Fitr, Eid-ul-Azha, weddings, etc.